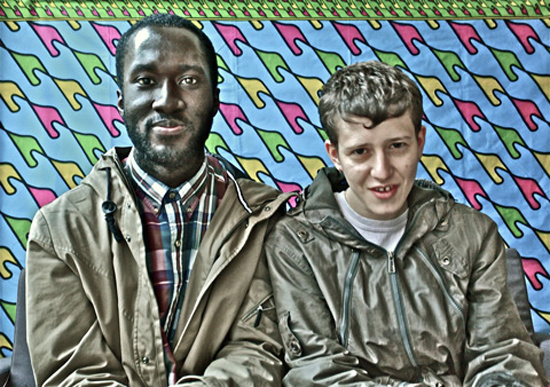 London-based musicians Kwes and Micachu have released the second volume of their collaborative mixtape series today. The follow up to the first volume - which was released digitally and on limited cassette in 2009 - Kwesachu Vol. 2 again features collaborations and reworks with a number of their friends and contemporaries, including Polar Bear/Acoustic Ladyland sax man Pete Wareham, Speech Debelle, Dels, Elan Tamara and Ghostpoet. You can listen to the whole mixtape via the stream below, or download from here. Kwesachu Vol. 2 was launched on Saturday night with a special collaborative show at London's Southbank Centre, featuring guest slots from Debelle and Dels. A limited 200 cassette run of the mixtape was given away to attendees. Like the first mixtape, which is still available here, this second volume is being given away for free digitally. The mixtape's tracklist runs as follows. 'HCHMWBIA' - ft. Ghostpoet/Grant Armour of CLOUT! 'DJ Set' - Micachu & Kwes. '(Ripped) Blossomshoes (excerpt)' - w. CLOUT! In related news, Kwes releases his new EP for Warp, Meantime, today. Read our interview with the man himself here, where he talks about positivity, Warp Records, and writing songs about being a cabbage. Micachu is set to release her second album with Micachu & The Shapes, the follow up to Jewellery, on 23rd July via Rough Trade. Entitled NEVER, it's a fully DIY effort, recorded in one of the band members' own studios, self-produced and mixed by the band in collaboration with Dillip Harris.